The second season finale of Star Trek: Discovery was the most extravagant, breathlessly action-packed hour of Star Trek ever served up in any incarnation, small screen or big. It was thrilling and exciting. But even as it felt emotionally "right" most of the time, it didn't make a damn lick of sense. A grand showdown has arrived between Discovery and Control. With help from the Enterprise, our heroes must hold off the killer AI long enough to complete Burnham's Red Angel suit and place the knowledge Control needs forever out of its reach. Discovery has often had to balance emotional payoffs with logical storytelling, and it has always tipped the scales in favor of the former. It destroyed the scales this week, forgoing everything in the name of what would look cool or feel cool. It chased these highs so doggedly that even while there were some good moments throughout the episode, they were always instantly undermined. Take the epic space battle delivered in this episode. Star Trek has never given us anything like this. It was expensive, awesome (in the true sense of the word), and immense. But it was also quite hard to follow at times. In showing us so much, it was hard to take in. Where were all these ships in relation to one another? Where was everyone in all this? What happened to Po? Take Burnham's tearful goodbyes to Spock. (Both of them.) They were both potent scene setups. But as a series, Star Trek: Discovery keeps wanting to have personal moments like this at times when it has amped up the jeopardy to such a degree than anyone taking a personal moment is being foolish and selfish to do so. Get in the damn suit, Michael! Open the damn wormhole, Michael! I totally agree that Sonequa Martin-Green is great, she's great with Ethan Peck as Spock, and so you want to give these two their moment. But they simply cannot realistically have that moment under these conditions. Take the fun gravity shifting fight pitting Georgiou and Nhan against Leland. Even though we've seen this trick in everything Royal Wedding to Inception, and know exactly how it's accomplished, it was enjoyable. I mean, we've never seen Michelle Yeoh fighting this way, so it was a fun scene that once again showcased her skills. Yet there were still confusing and unusual things about the sequence. The pursuit of Leland began with a Starfleet officer responding to an invitation to torture someone with "Yum yum." What the hell? And the topsy-turvy fight seemed to end with a sudden hole blasting two people who weren't previously in the scene out into space? Or something? I totally lost track, or didn't understand. Where was this fight actually happening and what were the real mechanics of it? Take the table-setting for season three. It was undeniably tantalizing. The very notion of a setting centuries beyond any previous Star Trek is inherently interesting. All the rules can be rewritten. The shackles of a half-century of continuity will be removed. In short, I'm into it! But... if killing Leland was sufficient to make all the controlled Section 31 ships go inert, how was that not defeating Control? And if Control was defeated, then why did Discovery have to go through with traveling to the future? 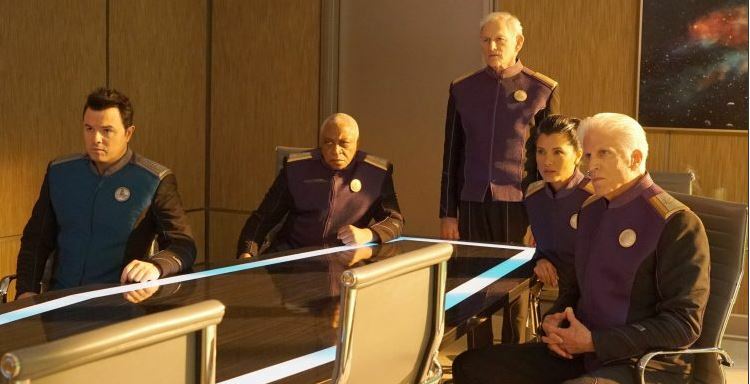 I thought Discovery was on a skeleton crew -- basically, just the bridge crew, who wanted to stand by Burnham's side and follow her into the future. So who were all those anonymous casualties filling up Sickbay? Did the whole crew decide to go with her? That seems implausible, and something we should have been shown if that was what we were being asked to accept. Culber had made up his mind to leave Stamets, and then changed it without explanation. What exactly motivated Culber to go back? It wasn't the brush with death; Hugh decided before he knew Paul had been critically injured. They're really just going to jerk the couple (and us) around all season and then wrap it up in one quick scene with no answers? Weren't there tons of solutions to the problem of the torpedo lodged in the Enterprise's hull other than Cornwell sacrificing herself? Why couldn't those half-R2-D2/half-Eve-from-WALL-E repair robots take care of it? How about the transporter? It was working, since they used it to beam Spock back from the shuttle. (While Enterprise's shields were up, seemingly.) Couldn't they have beamed the detonator out of the weapon, or beamed Admiral Cornwell out of the area after she closed the door? And why isn't the whole ship just made out of that door-and-window that can apparently withstand the blast? Speaking of Spock and the transporter.... wasn't Tilly somewhere deep in the guts of the ship at that very moment trying to get Discovery's shields working again so it could travel through the time rift? So, if its shields were down, why couldn't Discovery beam Spock aboard so he could go with them like he wanted? What are the limitations of the time crystal? The setup for all this told us Burnham was on a one-way trip to the future, but then she time-hopped around all throughout the second season to send the five previous "signals." You might assume that jumping across a greater length of time depletes the crystal faster, but then how exactly did the sixth and seventh signals work? Did she travel to the future, then come back once to leave a signal for Discovery to follow, then travel back again to leave the final signal for Spock? So... not a one-way trip after all? How could it ever make sense to put Ash Tyler in charge of Section 31? Given his history, is it ever possible to completely trust him enough to let him operate without direct supervision? After Spock comes up with the continuity-preserving idea that no one should ever speak of Discovery or Michael Burnham again, why does he immediately go and make a personal log entry about it? Is it completely impossible for anyone else to listen to his log, under any circumstance? There were flecks of gold to be panned from this episode. But to me, it was also a lot of style over substance, a complete Bruckheimerfication of Star Trek. Flashy, mostly empty calories. I remain hopeful for next season, but I found this finale bombastic and illogical. I give "Such Sweet Sorrow, Part 2" a C.
Game of Thrones served up a more quiet and contemplative episode than I think most viewers were expecting last night. But with basically the biggest battle ever put on film just ahead, it makes sense that the preamble to it would be proportionately large as well. 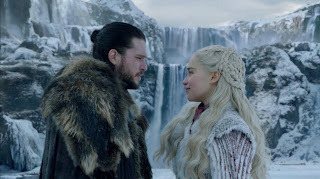 Where the season 8 premiere focused mainly on reunions and compelling "first meetings" (a theme that did continue to a lesser extent in this hour), this episode was built around a simple question: what would all of these characters we've come to know and love do with their proverbial last night on earth? The reactions weren't always surprising, but they were flawlessly fitting and often quite moving. Daenerys was fascinating in barely acknowledging the magnitude of the moment. Tonight, save the world; tomorrow, take the throne. She was still strategizing how to bring Sansa to heel. And the late revelation of Jon's parentage was pretty much what you'd expect: denial. Obviously, this was all just another scheme to keep her from her rightful place. Sansa was equally fascinating, and more subtle. You could sense that she wasn't necessarily taking victory and survival as the granteds that Dany was. But if she survives, she's doing exactly what she has learned to do -- planning for the next move, and the next move beyond that. For a few characters, the last night was all about its redemptive potential. Theon returned to Winterfell, continuing his neverending quest to atone for past decisions. Jaime Lannister began in a more resigned mode -- he wasn't even sure if he'd live to see the battle, depending on how Daenerys and the Starks reacted to his arrival. But he gravitated toward redemption as he asked to serve under Brienne in the battle... and then ultimately found his opportunity to do one final good thing in knighting her. 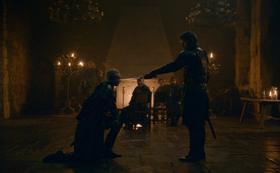 The knighting of Brienne was a wonderful moment, played beautifully by Gwendoline Christie. With almost no dialogue, she conveyed how much it meant to Brienne, how hard she was trying not to show that, and how impossible it was not to show it as the moment overwhelmed her. The characters with her there in that moment were perfectly chosen too -- Tyrion (who could appreciate achieving something that one would have thought impossible), Davos (who could appreciate rising so far above one's station), Podrick (who has been with her for so long), Tormund (who, though mainly used for comic relief with Brienne, got to earnestly enjoy this one serious moment), and Jaime (finally able to balance the ledger with her). When most people talk highlights of Game of Thrones, they talk about shocking deaths and soul-crushing plot twists. This was not one of those moments, but it was absolutely a highlight. Arya's chose to spend her "final night" with Gendry. For a character who's chased after nothing but death and vengeance pretty much for as long as we've known her, it was great to have her chase something else. And yet, as she lay awake in bed afterward, you had the sense that she didn't exactly get what she'd been hoping for. It was simply transactional, a different sort of "list" of Arya's that she got to cross something off of. A very interesting and truthful moment for the character. The episode also got out the war map for us, laying out the "plan" for the battle ahead -- one which we must assume won't unfold quite that way. But by getting that business out of the way now, the next episode can begin with its foot on the accelerator and never let up. It should make for quite an episode. This was quite an episode too, in its own, different way. I give "A Knight of the Seven Kingdoms" an A-. I appreciate how carefully it worked to wrap things up with characters -- so many as to introduce some doubt about what will actually happen to some of them in the battle. Clever and essential work. If there's a weakness to most cooperative board games, it's the way that often, not all players are always able to contribute. "Leaders" can emerge and dominate the experience, shutting out other players from participating fully in the experience. (And I say this as someone who has probably been that overbearing leader more than I should.) One way that some cooperative games try to address this is by making the game play in real time. I recently got to play such a game: A Tale of Pirates. Players are all trying to crew a pirate ship and navigate it through obstacles. There are different job spaces around the ship: cannons to be loaded and fired, a wheel to steer, a crow's nest from which to observe, and so forth. Each player's piece is a short sand timer. You flip it as you place it into the space with the action you want to take. When the timer runs out, you do the action, then must move your timer to a new space. Players must work together at spotting obstacles, attacking and boarding enemy ships to steal their plunder, and sailing the ship to safety and glory all within a limited amount of time. An app is the "game master," serving up increasingly more difficult scenarios for you to survive in increasingly tighter time frames. Coordination is key. The sand timers make the order things happen in matter, while the requirement to move to a new action each time means that everybody has the chance to do something important almost every round. 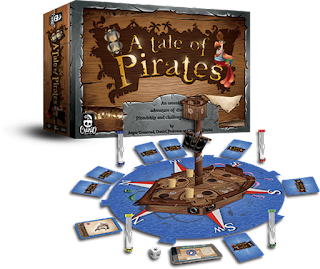 In a purely cosmetic (but also quite fun) touch, the game is played on a 3D pirate ship assembled of thick cardboard parts. You actually place your timer up in the crow's nest, actually spin the ship as it turns, actually raise the sails as you speed up, and so forth. It adds still more tactile thrills to the already potent immediacy of the timers. And it creates a hectic sort of fun. That said, boil away the bells and whistles, and the game reminded me a lot of FUSE. That's a cooperative game where players frenetically roll dice to disarm bombs aboard their spaceship. Though the components there are less extravagant, the game comes together for me in a far more satisfying way. A Tale of Pirates makes a striking first impression, but the actual experience of playing it just doesn't feel as potent, and it doesn't feel to me like it would have the same long life as FUSE. If the pirate theme sounds fun to you, A Tale of Pirates isn't bad. I'd grade it a B-. You could do worse in a cooperative game. But with other games around (and FUSE in particular), you could also do better. One lazy night a while back, my husband and I were in the mood for a movie -- but not one we'd find especially demanding to watch. We landed on Happy Death Day (barely aware of a sequel that had arrived in theaters). 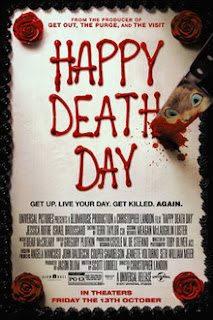 Happy Death Day is essentially a slasher movie mashed up with Groundhog Day (a connection the movie itself cleverly acknowledges). Spoiled sorority sister Theresa ("Tree") is murdered on her birthday... only to awaken again at the start of the same day. She must find out who's out to kill her and why, then avoid the same fate to break the cycle and stop repeating the same terrifying and painful day. Perhaps low expectations worked in this movie's favor, but we found ourselves enjoying it more than we expected. I think its because the movie itself wasn't content to be as simplistic as most slasher films; it's not just a "one thing" movie. It's part slasher, part science fiction. It's Groundhog Day, but also a bit Mean Girls. As it serves up the visceral thrills of a horror movie, it's also actually rather funny overall. And it packs all this into a tight 96-minute package that doesn't overstay its welcome. There are some clever twists in the plot best not spoiled. It serves up a wide variety of entertaining deaths -- as all horror movies must, but which seems especially appropriate here in the "repeating day" scenario. There are just enough red herrings woven in to satisfy; even if you get ahead of some plot developments, there's a fair chance you won't anticipate them all. And I'll say semi-vaguely that the movie does an excellent job of blending the "learn to be a better person" conceit of Groundhog Day with the "one last scare" trope of horror movies. The cast is made up mostly of unknown actors, from top to bottom. In the lead role, Jessica Rothe is fairly strong, realizing a character arc of growth and change while serving up the required "scream queen" moments. But like the only names you might recognize are behind the scenes here: director Christopher Landon is the writer of the Paranormal Activity sequels, while composer Bear McCreary provides some fun music that brings moments of "teen movie" to the suspense vibe he established in 10 Cloverfield Lane (among others). While Happy Death Day didn't rocket to the top of any particular movie list I might make, I did like it enough that I'll probably seek out the sequel at some point. It's a solid B movie (which you can take in more than one sense, I suppose). If you're a horror fan, it's well worth checking out. The most recent episode of Star Trek: Discovery, the first half of the second season's two-part finale, was either elaborate punking of its audience, or a bold commitment to a radical restructure of the show. And either way, it was an effective installment. When the attempt to destroy Discovery (and the sphere data it contains) fails, the backup plan to protect the galaxy from Control is a dramatic one. Using a new Red Angel suit, Michael Burnham will guide the ship into the distant future, beyond Control's reach... and without the ability to return to her own time. It feels like this episode shouldn't work. As promised in the title, "Such Sweet Sorrow," it's nothing but a series of goodbyes. There are really only two ways it can go from here. 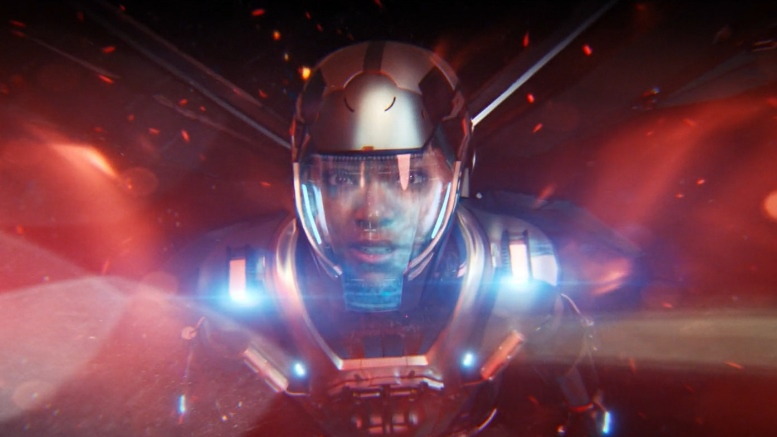 Either Discovery will find a way to stay in its time after all, meaning all these goodbyes were just an elaborate (but effective) con to make us believe it wouldn't happen... or this was effectively serving as a series finale to this incarnation of Star Trek: Discovery, as the show jettisons its original premise to begin again in a future time frame. It sure seems like the latter move is the one they're going to make, doesn't it? They've piled nearly all the main and recurring characters on Discovery; they just have to get rid of Spock somehow in part two (and, possibly, add Culber and/or Ash Tyler). A jump into the future would go a long way toward explaining any continuity issues with the series that might still be nagging long-time Trekkers. And while this would be the series' biggest move yet, it's not like it's been adverse to bold moves before -- treating the ship's captain like a Defense Against the Dark Arts teacher and getting a new one every year, for example. But we'll know soon enough. For the moment, I'll focus on what we did see rather than what we might see. Once again, at the risk of sounding like a broken record on this point, we saw excellent acting from Sonequa Martin-Green. There was no emotional roller coaster to Burnham's story this week, the needle was pegged the entire time. You'd think Martin-Green would be wrung out, or that we'd grow tired of watching her cry, but we got one goodbye scene after another, and she was excellent in all of them. The goodbye with Sarek and Amanda depended on the ridiculous conceit that Sarek's meditation was premonition enough to tell them where and when to be to even have this goodbye. But get over this conceit, and you got to enjoy a wonderful scene that was also James Frain's finest work on the show as Sarek. The goodbye with Ash Tyler shouldn't have meant much to me (as I've long since stopped carrying about the "will they / won't they" of this relationship), and yet Martin-Green really made me believe how painful this was for Burnham. I also liked the detail that Tyler stood there in the big group moment, but then privately admitted, "nope, I can't actually go through with this with you." A brutally honest character moment for him. The other big "reunion" was Pike (and the audience) with the bridge of the Enterprise. My own feelings on this were rather mixed. I totally understand that they were never going to give us the Enterprise as it looked in 1966 -- nor should they have. The Next Generation scratched that particular itch when Scotty walked into the holodeck that one time; now was the time to bring a modern budget and sensibilities to the classic Enterprise. You know, just pretend that the old SD cameras of the 1960s weren't capable of photographing the Enterprise bridge as it truly was; pretend it looked like this all along. But I thought that on the continuum of honoring original Trek design elements and modernizing the look, they might have fallen a bit too hard on the latter for my taste. I found the ship a bit too shiny and chrome; it has been out on a five-year mission to distant points in the galaxy, after all. Make it look a bit more lived in. Still, there were classic details honored in the new set that made me smile: the garish red-orange paint, the light-up handles in the turbolift, and so forth. It might be tough to evaluate this episode without the context of its second half. But you know that's not going to stop me. I give "Such Sweet Sorrow" a B+. It will be quite interesting to see where they go from here. The Orville took a couple of weeks off (I suppose to stay out of the way of March Madness? ), but then came roaring back with its best episode to date -- a potent combination of the moral storytelling of Star Trek: The Next Generation with the culmination of ongoing plot threads like Star Trek: Deep Space Nine. A Moclan couple uses the Orville to secretly transport their infant daughter off their homeworld, which in turn leads the ship to a hidden colony of Moclan females. Fearing discovery, the colony leader is persuaded by Mercer to petition for independent recognition by the Union. But what's just is not politically expedient; the Moclan homeworld threatens to withdraw from Union membership if the colony of their female outcasts is recognized. The sheer number of Star Trek veterans involved in this episode was staggering. Most obviously, Marina Sirtis (Counselor Troi) played a school teacher about the Orville. But guest stars F. Murray Abraham and Tony Todd have also appeared on Star Trek. Then there's the writer of this episode: Joe Menosky, the man behind several memorable Treks including Darmok. And also Commander Riker himself in the director's chair: Jonathan Frakes. But it wasn't just the Star Trek pedigree that made this episode so effective. It was the way the series drew on its own past. The Orville has been slowly building up the Moclans since early in the first season as allies of suspect morality. Because the writers exercised patience in setting this story up (with compelling chapters along the way), the payoff now was stronger. We've seen the treatment of Moclan females time and time again, enough to easily and instantly root for them. We've seen Klyden's intolerance, enough to cheer Bortus for taking a firm stand against him, and to feel for Topa, caught between two parents with very different values. The Orville also utilized its two seasons of history by bringing back a number of past guest stars. Rena Owen returned to play Heveena, leader of the Moclan settlement. Pretty much every actor who has ever played an admiral on the series was back here -- but together in one room instead of speaking on a viewscreen. It all added to the sense that this was a major milestone for the series, one that it had been working toward for some time. The ending charted its own path that was neither entirely hopeful like a Next Generation episode, nor boldly bleak as Deep Space Nine sometimes dared to be. The female Moclans secured the safety of their colony, but they did not receive Union recognition. The "underground railroad" from their homeworld was shut down too -- though clearly, we were not meant to believe this would truly quell resistance there. It felt like the sort of diplomatic compromise, leaving all sides not truly satisfied, that you'd actually expect in a real situation. The Orville is about to wrap up its second season, and it seems to be going out on a high note. I've never found it stronger than this. I give "Sanctuary" an A-. Centered in Winterfell (it's in the title), the episode mostly dealt with the arrival of Daenerys and Jon Snow, and the friction it created with Sansa. All the while, the threat of the undead army marched ever closer. I feel as though some will complain of this episode that the plot progressed only incrementally. I myself was quite happy at the pace. The well-drawn characters have always been the greatest strength of the show (and the books). It's because of that that you care when they experience hardship, or are suddenly killed off, or what have you. Yes, there's a lot of plot ground to cover in the few remaining installments. But if the show doesn't spend a good amount of the time left on the characters, then what's the point? In that respect, the episode hit every beat you'd want it to. Reunions were key, with characters coming back together who haven't seen each other in years -- or, in some cases, since the very first season. Arya in particular had a lot of the reunions that you knew would be fun to see, and they were: Jon cluelessly asking if she's had a chance to use the sword he gave her, playful taunts with Gendry, and not-so-playful taunts with the Hound. But while the Arya scenes might have been among the more anticipated in the episode, they were not the most potent. Setting aside the episode's final moment, a powerfully silent reunion between Bran and Jaime (that had been cleverly foreshadowed with earlier Bran creepiness), I'd say the most effective reunion was the one between Sansa and Tyrion. Of all the trials that all the characters have experienced, a compelling case could be made that Sansa has changed most in the last few years. She's certainly not the same as when Tyrion last saw her. She's studied at the University of Littlefinger (and supplanted the teacher), and it was quite the transposition to now see her schooling Tyrion in the true motivations of power players. The scene showed us how smart Sansa is, as did her interactions with Daenerys -- we didn't just have to rely on Arya telling Jon about her savvy in a different scene. The most potent "first meeting" was that between Sam and Daenerys, a scene that started light but quickly turned dark when Sam learned his father and brother had died at her hands. This felt like a very important milepost in the grand scheme of what's left in the story, a subtle reminder of what I think it's been carefully building toward all along: Dany seems far more likely to me to be a villain than a hero when it's all done. Of course, just because character was king in this episode doesn't mean some plot moves didn't happen. Theon rescued Yara from Euron. The dead were shown to be on the move toward Winterfell (in a truly creepy scene at Last Hearth). Plus, of course, the biggest scene: Jon Snow no longer knows nothing. Sam dropped the bombshell of his parentage on him. Though an important scene, I think it won't be nearly as impactful as the moment when Daenerys finds this out. Something to look forward to. All of this, and a surprisingly different opening credits sequence too -- with just a couple of major locations worth showing, the clockwork map took us deeper inside those locations, after making clear the advancing undead army coming through the fallen Wall. Though no one would likely hold this episode up as one of the best of the series, I found it a good and encouraging start to the final run. I give it a B+. Giving you my thoughts to choke on.